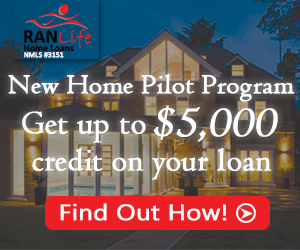 RANLife Home Loans, a Utah based lender, announced that a new purchase program will be available to aid buyers of new home construction nationwide. By promoting this program, RANLife hopes to strengthen their relationship with the building and developing community to facilitate more home buyers into new homes. As a result of the recent rebound of the residential construction market, RANLife Home Loans recently announced that a new purchase program will be available to support buyers of new homes. The New Home Pilot Program allows home buyers to receive a credit on their mortgage, up to $5000 to use towards closing costs, easing the financial strain for both the builder and home buyer. When RANLife revealed the new program they had one objective in mind and that was to construct a network with other builders and developers in the community. RANLife knew that by partnering up to become a preferred lender they could effectively assist more home buyers into their dream homes. “Not only is this an opportunity to help people become home owners, it is a way for us to demonstrate to the developing community that we are a serious lender and can get loans closed quickly,” stated loan officer,Jesse Curtis. In the last year Curtis introduced National Commercial Properties to RANLife Home Loans and their working relationship together has become a major success. With nearly all builder incentives, the credit is usually given by the builder themselves. However, with RANLife’s New Home Pilot Program, the builder’s costs are rest assured as RANLife provides the credit towards closing costs. “By offering this incentive we can prove to builders how good and fast we are at closing loans, plus we can give them and the client a financial lift,” commented Curtis. Loans must fund before Oct. 1, 2013. What makes the New Home Pilot Program so ideal is that it offers incentive to each and every party involved: RANLife gets to assist more home buyers into new homes, the builder's costs are reduced and they get a quick, reliable lender to send their clients to, and most importantly, the client gets free assistance towards their mortgage as well as the best customer service throughout the process. "This is a huge deal because it is a program that other lenders fail to offer," Curtis explained. Any builders, developers, or buyers of new homes are encouraged to contact RANLife Home Loans today to inquire about all the different finance savings options available. This article was originally published on PR Web. For the full article click here.